Eating fish in Sicily is as good as it gets. Especially in and around the fishing villages. In Riposto, my Uncle Benny’s town, we ate at a restaurant that was right on a pier over looking the Mediterranean Sea. The eatery was nothing fancy, the four walls of the restaurant were open and in the distance you could see the fishing boats bobbing up and down in the water. After we took our seats the waiter came over to our table and explained what was on the menu for the evening. He led us over to a large ice chest that was made of wood against a wall and opened up the lid to expose the “catch of the day”. Presented before us was a large assortment of fish that was brought in on that days catch by the local fishermen. We had to choose as he explained what each fish was. It didn’t get any fresher than that. There were two women in the kitchen that were ready to prepare whatever we picked for dinner that reminded me of my grandmother. Truly a home cooked meal. That evening I had one of the best seafood dinners in my life. My earliest memory of eating fish is eating it this way. Simple ingredients with wonderful flavors that enhance the fish, not over power it. It’s simple to prepare and is ready in no time. For this recipe I’m using Pollock. Probably the least expensive fish at the market. But its large flaky meat is mild and taste great prepared this way. 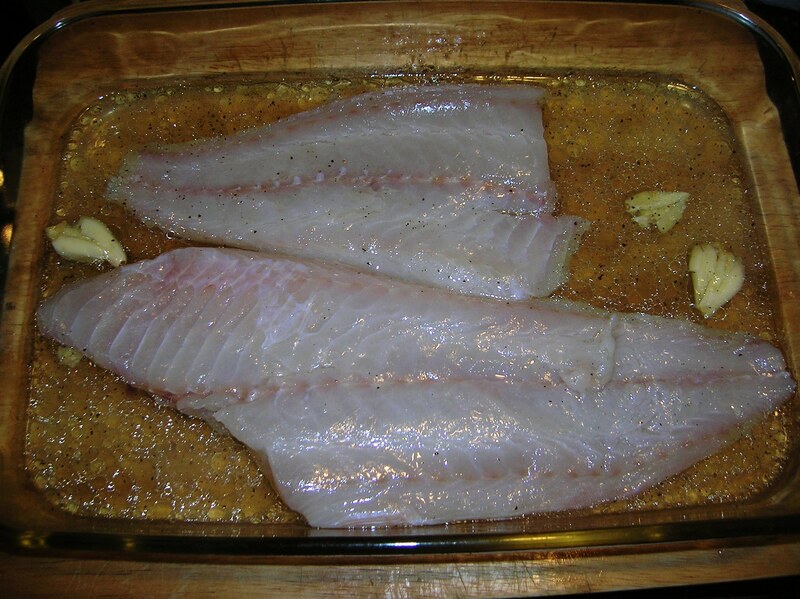 4 fish fillets, any white flaky fish will do, cod, scrod, pollock, Turbot, flounder, etc. 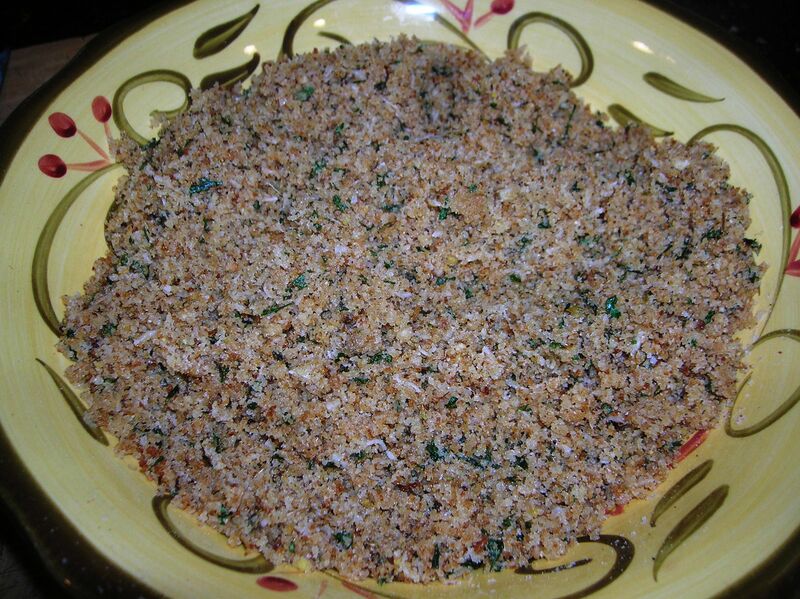 *To prepare the breadcrumbs, take 1 cup of plain bread crumbs. To that add 1/4 cup of Romano Cheese, 1 clove minced garlic, 3 tablespoons of chopped parsley, 1 teaspoon of dried oregano, 1/4 teaspoon salt and freshly ground pepper. Mix well. In a medium frying pan over medium heat melt 3 tablespoons of butter and add 2 tablespoons of olive oil. Add the bread crumbs and lightly toast, stirring constantly, for about a minute. Take out of the pan and place in a small bowl and set aside. 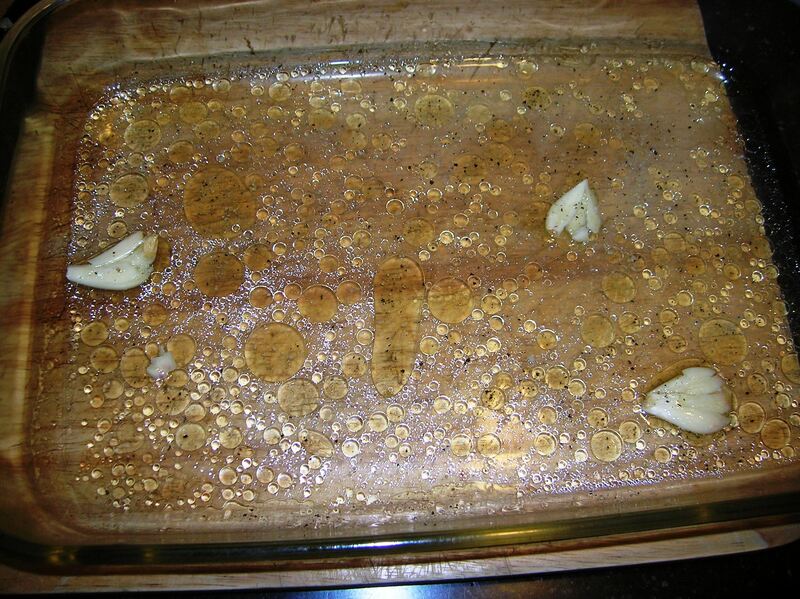 In a roasting pan, large enough to fit the fish in a single layer, squeeze the juice of one lemon. To the lemon juice add the white wine, 1/4 cup olive oil and the 4 whole cloves of crushed garlic, salt and pepper. Stir the sauce to combine. Dip the fish on both sides in the pan liquid and place fillet in a single layer. 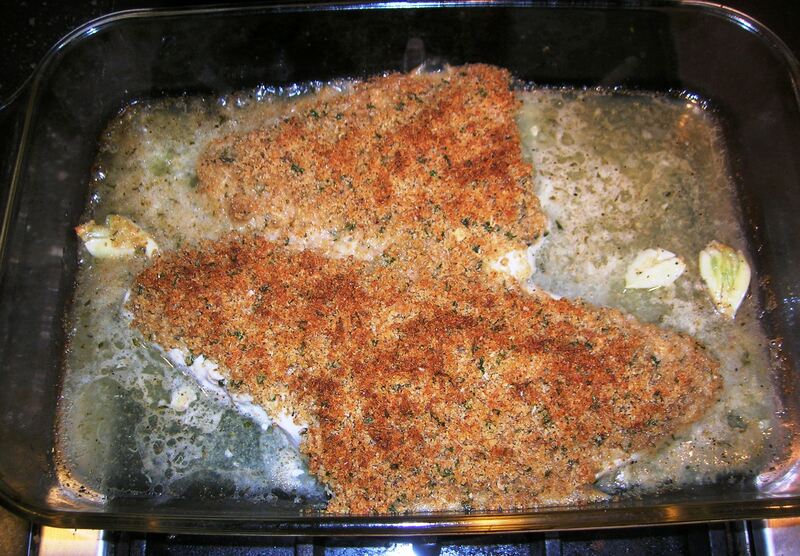 Sprinkle the prepared bread crumbs on top of the fish to coat evenly, be generous. 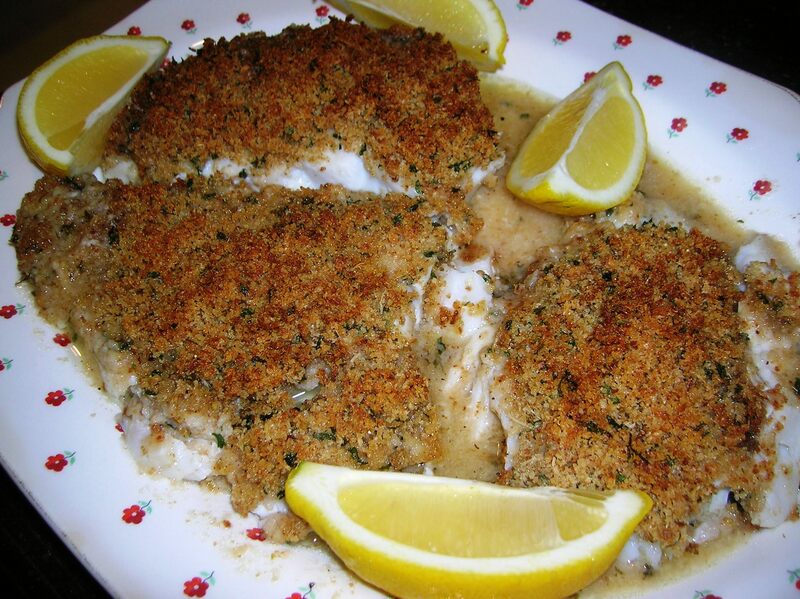 If you have left over bread crumbs these are great sprinkled over steamed vegetables and served along with the fish, like broccoli or cauliflower. 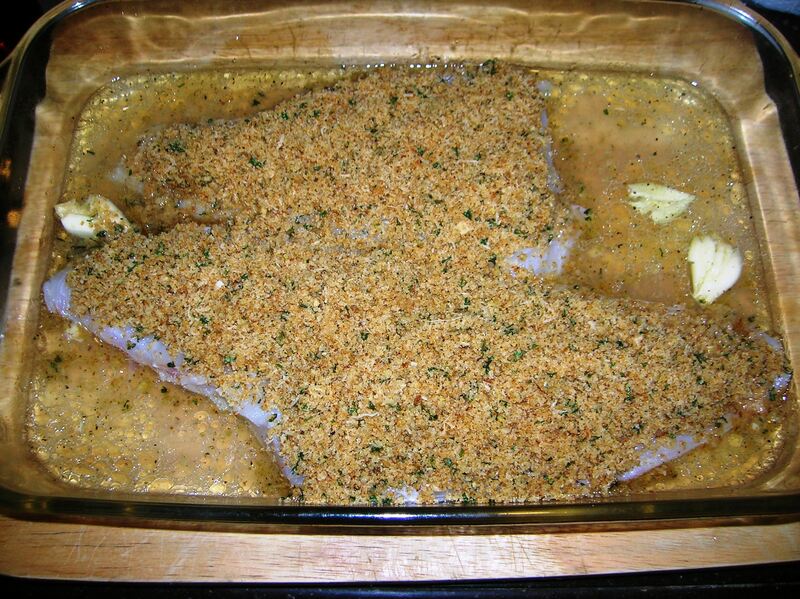 Bake the fish in a pre heated 375 degree oven for 20-25 minutes. Do not over cook the fish. Remove the garlic before serving. 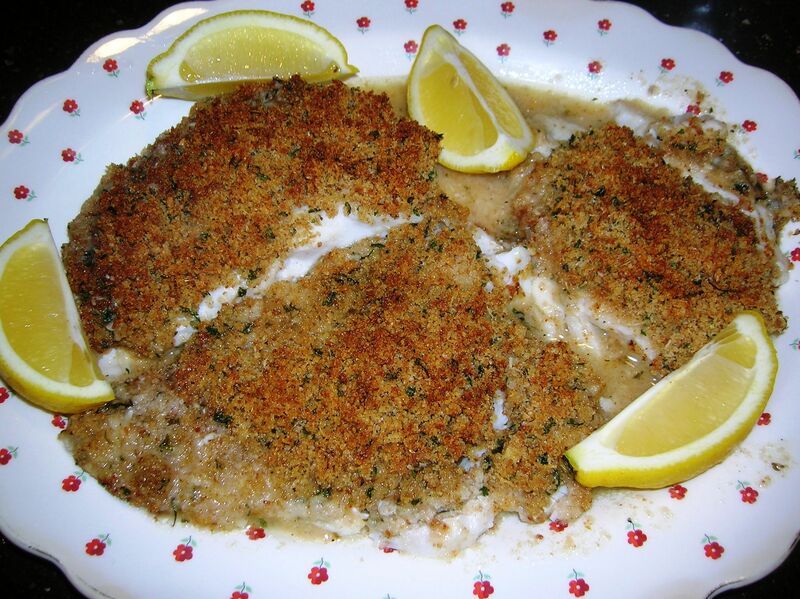 Serve the fish in individual plates or family style with lemon wedges. Drizzle the sauce from the pan around the fish. This entry was posted in Seafood and tagged Filet of Fish oreganato, pollock. Bookmark the permalink. Best fish filet recipe! Simple, yet perfect! Thank you Lauren. Most good Italian food is simple.